During the 2018-2019 school year, Enosburg High School students can expect to see many changes around the building. With so many drastic shifts in our community, the need for student voice in decision making has become stronger than ever. In an effort to give their peers a louder voice, the High School Redesign (HSR) class has been looking into reforming one of our school’s traditional systems - the student government. As it currently stands, the student government is widely considered a glorified party-planning committee. Each class is responsible for hosting one of the four annual dances. Powell, who joined the council this year, expressed that she felt let down by the amount they could actually do. Wishing to see the system transform, she brought the idea of reforming this system to the students of the HSR class. It has become their mission to change the dynamic of student government so the reps have more say in what goes on around EFHS. After much discussion and lots of planning, a reformed structure has been established. In this new system, each class still has its traditional officer positions (though under different names, and with a few additions). Instead of focusing on planning dances, they will focus on getting opinions from their respective class on topics that become relevant throughout the year. The officers will endeavor to host a “forum” with their class once every quarter. Forums are structured, whole class meetings that exist so the student government members can pass along information and receive input on it from their peers. This will give students a louder voice when large decisions are being made. Don’t fret, however. Dances aren’t going away! Planning events will be a responsibility assigned to a separate committee. Many adults who are involved with student government have expressed their support for the upcoming system. The HSR group hopes to host a ‘beta’ forum before the end of the 2017-2018 school year to identify any areas of improvement. If you are interested in running for a position in this new system, keep an eye out for applications at the beginning of next year. Hopefully, this system reform helps give EFHS students a louder, stronger voice. Boogie Bombs In Tilted Towers? Have you noticed your classmates being distracted lately? Have you heard them talking about kills, skills, and tiers? If yes, then you are experiencing the Fortnite craze. Fortnite is a co-op sandbox survival game, that was released on July 25, 2017. It can be played on iOS, PC/Mac, Playstation, and Xbox. In the first two weeks of Fortnite’s launch, there was over 10 million players. It was developed by Epic Games and People Can Fly, and published by Epic Games. Fortnite is a zombie survival game where players can either play in squads, duos, or play solo to try and be the last person or group standing. The game begins with the players parachuting onto an island as storm clouds gather. Only armed with a pickaxe, players round up weapons and supplies to build bases, and run to stay out of a deadly storm that shrinks. In the survey I conducted 69.6% of the 46 responses said they do play Fortnite. For the people who do play, the amount of time they spent playing the game per week was more scattered. The highest percentage was under an hour which was 35.1 percent. 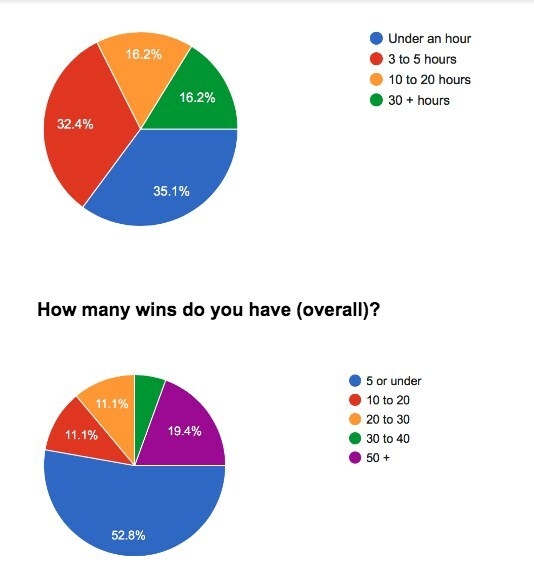 The least percentage was tied for 10 to 20 hours, and 30 hours or more at 16.2%. The highest percentage for the amount of wins overall was 5 or under, at 52.8%. The lowest percentage was for 30 to 40 wins at 5.6%. Even though that was the lowest percentage, the second highest percentage was for 50 wins or more, at 19.4%. From the survey, emotions that people feel while playing the game were all over the place. People seem to have mixed emotions while playing the game from happy, to sad, to mad, to high anxiety levels, which leads into why people seem to like it. EFHS students said things such as: “Happy when I win and am having fun mad and pissed off when I lose”. People seem to like it because they can play it with their friends. A majority of the responses said, “I only like it when with friends. Otherwise it is lame to be honest”. A lot of people said that they only like to play with friends, in squads, or duos. People also like it because of the adrenalin rush it gives, the challenge, and the survival aspect of it. A responder said, “Because it’s something new and challenging”. On the other hand some people said that those are the exact reasons why they don’t like it. Some people also said that they don’t like it because of the graphics, and because people won’t stop talking about it. Despite not placing first, the Enosburg Falls High School snowboard team ended up placing fairly well during the state championship at Okemo Mountain Resort On March 17th. With placing in second for Giant Slalom, third for slope style, and fifth for half-pipe. The team agreed that while half-pipe is usually their best event, they didn’t do as well as they had hoped for their run to a championship. In conclusion, the team itself was well formed around, having great chemistry which then resulted in a great season.